← Wrapunzel Ladies do the “Zig-Zag Criss-Cross”! I would love to see a tutorial! That is beautiful! I would LOVE a tutorial!!! Its just gorgeous! This is definitely tutorial worthy! I see these skirts all the time at local shops and some of the patterns are stunning. Learning to wrap one as a head scarf would be awesome. Absolutely a stunner. Wow! Yes, I’d love to see how you created this one. I would really enjoy seeing how it is done! It looks SO pretty!! Cool. I’ve thought about using a skirt before but felt that it was too much fabric. I have used shirts before. 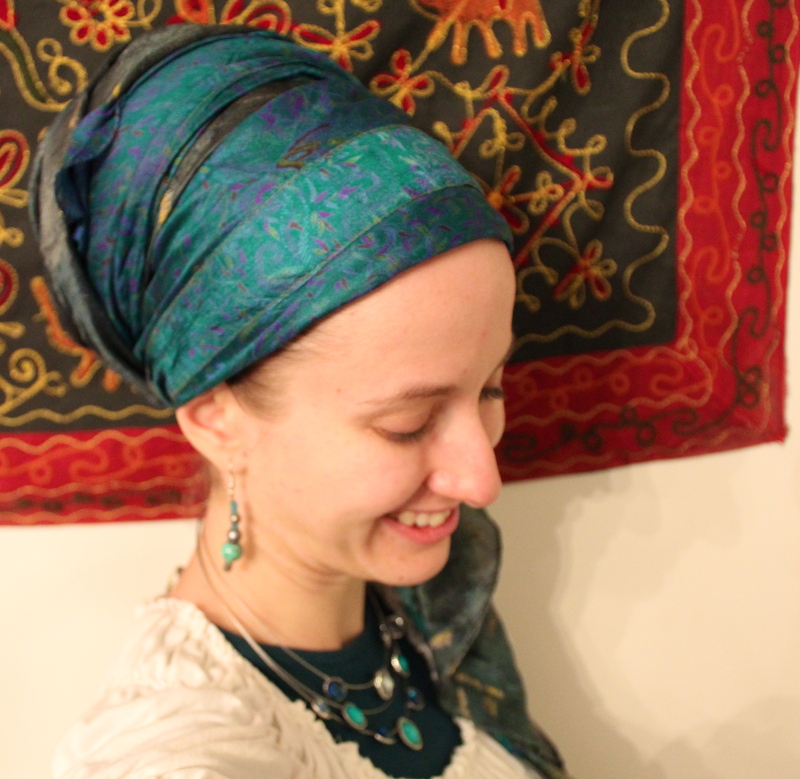 I have a link to my video on my blog, the Daily Tichel, if interested. This idea is fabulous. Do you suppose along with the tutorial you could show the wrap skirt and reveal the measurements? A wrap skirt pattern would be easy to do via the measurements. Also, the exact description of the fabric, so its not too heavy as a tichel would help. Such a great insight you came up with. Yes, definitely want a tutorial——-that is hands down the prettiest thing you’ve ever done!! Great job. I too have a new fluttery skirt that I thought I’d have to wait for spring to wear. It’s not a wrap-skirt though but it is silk. It doesn’t have any zipper either, just an easy elastic waist. Wow! I knew you were creative, but I didn’t realize you were *this* creative . . . Yes I totally want a tutorial – thank you, generous beautiful lady! (If you do want to wear it as a skirt, I often just layer such skirts over another of similar or slightly shorter length that’s warm enough for the season. It works quite well for wrap skirts, at least.) 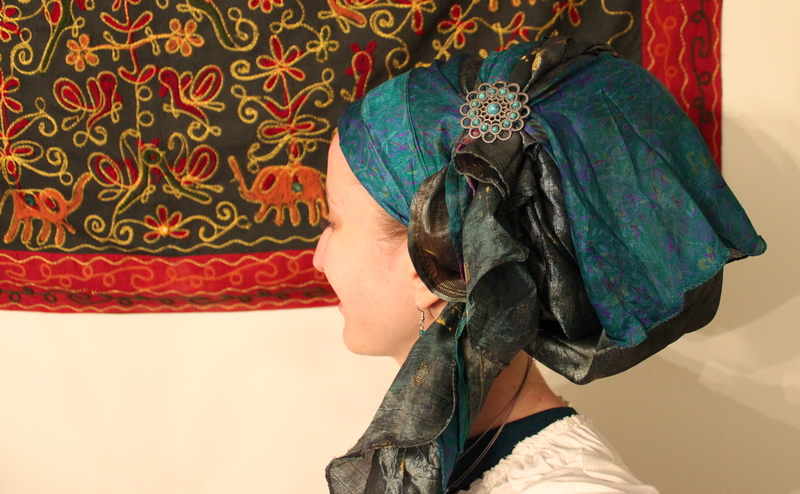 But as it is- it makes a gorgeous tichel. Please give a tutorial. It’s just beautiful. Thank you so much for sharing your magical ideas! Would love to see another tutorial! Looks great! Sorry if I repeat a question that someone else may already have asked, but where did you get the “oomph cap” from? Thank you again so much! I have a couple of skirts like that — one a lighter green and one pink — and I’d LOVE to know how to use them as a wrap! I agree, as I also have a couple of skirts like that, they are now too short to wear, and could be used as tichels. They are just hanging there now for too many seasons. where do you get the skirts, maybe you should think about carrying them also?? a tutorial on this would be wonderful! i have a few skirts that i am going to try this with NOW!